To Sum It Up: Avery Pike’s talent for creating steam is invaluable in Dome Four, which depends on it for power and to make conditions livable for its inhabitants. World War III has turned the air outside toxic and reduced people to existing inside of domes. Although being an Elementalist like Avery is brings a higher social status and certain privileges, she would give up everything, including her gift, to find out what happened to her parents, who vanished eight years ago. When a stranger appears one day with possible information about them, Avery can’t resist agreeing to hear what he has to say, not only about her mother and father but also about Chromelius Academy, a school for Elementalists. Anywhere other than Dome Four and required steam production seems like a better opportunity, but it isn’t long before Avery beings to wonder if Chromelius Academy isn’t its own kind of prison. Review: The few (by which I mean, like, three) books I’ve read that featured a steampunk-ish touch to them had precisely that—just a touch. Steam-powered vehicles and clockwork gadgets were everyday objects in these worlds, but the steampunk element itself wasn’t all that integral to the story. Steel Lily was different in that respect, with fifteen-year-old Avery Pike’s ability to create the steam necessary to power the dome under which she must live because the air outside isn’t fit for breathing playing a key role in the plot. Avery’s talent as an Elementalist is obviously highly prized, and the book revolves around her trying to figure out who her true friends are and who just wants to use her gift for nefarious purposes. I was fascinated by the idea of Elementalists as well as the technology of this world, and I think what really stood out to me about the latter was seeing it in action. Like Avery’s ability, the gadgets, including a mechanical buggy that resembles, well, a giant bug, aren’t merely described but are given vivid demonstrations of what they do. This made all the difference to me because I’ve read other dystopian/post-apocalyptic novels in which the tech stuff was discussed in minute detail but not put into actual use enough for me to take an interest in it. Here, I found myself intrigued by the workings of the machinery. The one aspect of the world that I thought needed a bit more fleshing out was the history of World War III. The novel supplies the basic facts, but that was my quibble with them. They felt too bare bones and didn’t sate my curiosity about what had happened. I really liked the novel’s characterizations and thought they were its strongest point. Avery is a smart, feisty heroine, and I admired her protectiveness toward her best friend, Alice, a Traditional (someone without a gift like Avery’s). Their bond of friendship runs deep, and one would never go anywhere without the other. I was also impressed with Sari, Chromelius Academy’s tech genius extraordinaire, because I think female computer experts are extremely cool. Mr. Jaxon Pierce, without a doubt my favorite character in the book, requires his own paragraph because . . . he’s Jaxon. If mind-bogglingly egocentric and acerbic male characters are your thing, as they are mine, then you should love Jaxon. This guy never seems to be at a loss for something witty to say, and I lost count of how many times he cracked me up. But there’s also a hint of a tortured soul lurking inside of him; one-dimensional he most certainly is not. I believe that Jaxon would agree that every page he appears on would not have been the same without his magnetic presence. I can tell you now that I’ll absolutely be continuing with the series because he’s such a great character to read about. While the middle of the book moved a little slowly for me, the ending came as a big surprise. The turn it took was clever and unexpected, and the conclusion itself gave a good amount of closure while smoothly setting up the next book. Series these days seem to almost always end on a cliff-hanger that makes you want to slam your head against the nearest surface, so this was a welcome change. You’re left wondering what the future holds for these characters, but there’s also a sense of satisfaction in knowing they’ll be okay until you next meet up with them. Which I hope will be soon. 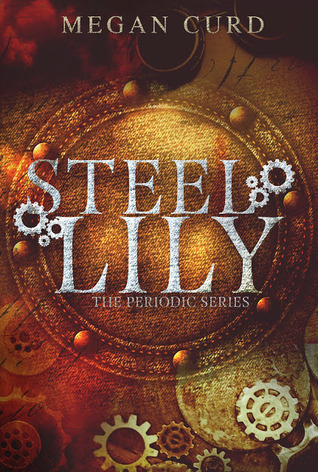 All in All: Steel Lily is a promising start to a new series that finally made steampunk work for me, and Jaxon is a character whom I think everyone should meet, especially if you love snarky boys. Congrats on your win! I hope you enjoy reading this and love Jaxon, too! I don't remember if you've read it before but now that you're liking steampunk I suggest you try Girl In A Steel Corset and the rest of the series. Its my favorite YA steampunk series. Gail Carriger's is good too but the steampunk flavor is mild. I've read Girl in the Steel Corset and thought it was pretty good. I've been meaning to get around to the other books in the series; now would probably be a good time to do that, since I've been reacquainted with steampunk. Ally really liked the first Parasol Protectorate book, which is also on my TBR. Ohh I loves the snarky men...I need to check this out! Haha! I LOVE them, too! And the snarkier, the better! I've been wondering about this one! It sounds good! Avery sounds great! And Jaxon sounds fun and I do love witty, tortured soul types! The technology and everything sound really interesting, too! I will try to read this at some point! Great review! Jaxon is a fantastic character and definitely made the book for me. I hope you get the chance to give this a read!